As our fleet of Puddle Jump boats approach the equator on our Pacific passages from the Mexico (and elsewhere) to the South Pacific, much talk goes on about “celebrating” at the equator. I wondered how this tradition came to be. I knew that aboard ships in the US Navy, prior to crossing the equator, there is much planning done by the “Shellbacks” — those that have already crossed before — in preparation to indoctrinate or “cleanse” the sailors that have not crossed, i.e., the “Pollywogs.” Whenever the crossing occurs (which could be daytime or in the middle of the night), the Pollywogs are subpoenaed to the decks: “You are hereby commanded to appear before the Royal Court of the Realm of Neptune, in the District of Equatorius… because it has been brought to the attention of His Highness, Neptune Rex through his trusty Shellbacks, that this ship about to enter those waters are manned by a crew who has not acknowledged the sovereignty of the Ruler Of The Deep, and has transgressed on his domain and thereby incurred his Royal displeasure.” Then, a fully costumed and seaweed adorned “Neptune” appears before them, with sometimes “Davy Jones” at his side, indicting the Pollywogs for further charges. The Pollywogs, groveling on the deck at “Neptune’s” feet then are put through a sort of college fraternity-like hazing, with demands to eat globs of grossly concocted food combinations that the cook has made up, dousings with buckets of salt water, and other humiliating feats all in the presence of the Shellbacks on board. …sailed the high seas and bounding main for many years, … failed to appear in person to show allegiance to his Royal Highness, thereby masquerading as a man of the sea, and by this utter disregard added insult to other previous crimes. Charge 2: Taking liberties with the piscatorial subjects of His Majesty Neptunus Rex. So where did this tradition begin? My research shows that this ceremony’s origin began with the French ships in the 16th century. At first the rites were performed when the ships passed around a major cape safely for the first time… but as time went on, this hazing celebration was extended to sailors who passed the equator for the first time. Even though during these days, paganism had given way to Christianity, sailors still remained a superstitious bunch and would do anything to appease the treacherous seas. Eager to please the ancient god of the sea, Neptune, the humiliation, and fines paid were a small price to pay to get Neptune’s blessing. The English eventually followed in the practice in the next century, with even Captain James Cook writing about it in his journals. In Cook’s day, the ship heaved to and the pollywogs were hoisted over the seas by the mainyard and were dunked into the ocean water 30-40 feet below them. If the pollywog was an officer of the ship, who’s dignity wouldn’t allow such a dunking, they had to forfeit pay … usually in the way of bottles of rum for the after-dunking party. The original equator crossing ceremony was a serious event, but today, it is another excuse to celebrate how lucky we are to be sailing the seas, as well as an event to break the boredom of our long passage across the ocean. Frequently at the equator, vessels are becalmed and a bit of celebration is a welcome reprieve from the monotony of drifting under a baking sun. Nowadays, a liberal dousing with saltwater usually substitutes the dunking from the sides of the boat, and the forfeiture of pay is usually making a tithe to Neptune with a tossing into the sea of a coin from the sailor’s last port of call. Many will post a letter to King Neptune, i.e. 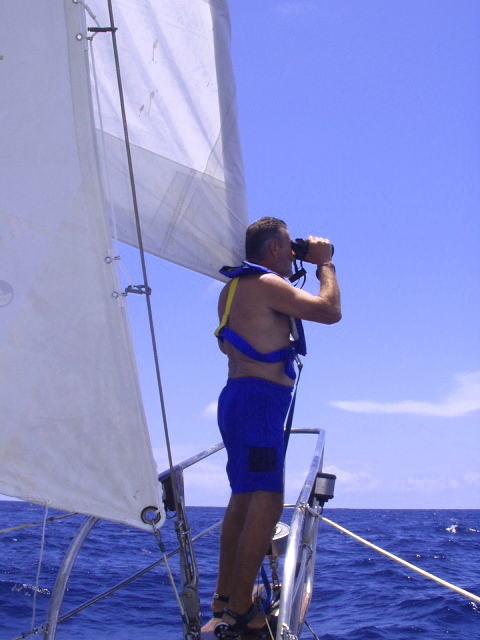 placing a note recording the equatorial crossing position of your vessel with the names of the crew on board in a bottle, and setting it adrift. And of course, most cruising boats today substitute the after-indoctrination party’s bottles of rum with a toast of champagne… some of which is tossed into the sea for the merriment of Neptune! 1) U.S. Naval Institute, in Annapolis MD, phone number (410) 295-1053, website: www.history.navy.mil/faqs, or you can place your order and receive further information by e-mail from: certificates@usni.org. As for us, well we’re still about a week away from the equator now aboard our sailing vessel, Mi Gitana. I, being the pollywog, have no idea what my husband, Joe, (who has crossed the equator many a time on Navy ships), the Shellback, has in store for my and our vessel’s rites of passage. Hopefully I will not be the sacrifice he offers to keep in the good graces of Neptune! That will be another story. Joe looking for the mysterious "Line" for us to cross.